"Watching Andrew slip over the side and the subsequent hour and forty minutes it took us to recover him was the most terrifying ordeal of our race. The manner in which the crew reacted was textbook; a testament to the rigorous training provided by Clipper. Andrew's sheer determination and also the fact he remembered his Sea Survival training were crucial with such a long time spent in the water. The knowledge that our friends on OneDLL were diverting to help us search was another huge source of comfort for which we were all gratefull". 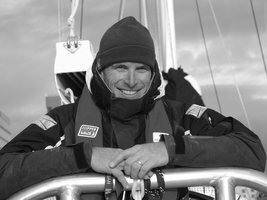 "As a family we are deeply indebted to the patience and expertise, of Skipper Sean McCarter, and his wonderful crew of dedicated amateur sailors, who on that night, truly showed all the team spirit and skills, they had learned throughout their Clipper training, which no doubt played a major part in the successful rescue of a beloved son". "It was probably the longest night of my life. I was alone in my house that night not as alone as Andrew was, but nonetheless I had to keep my emotions in check so that I could perform my job well and do what was necessary. My grimness turned to elation when he was recovered alive, I could not sleep for the rest of the night". Later, we were able to plot a wonderful surprise to meet Andrew as he sailed back up the Thames and I don’t recall ever being so happy to see someone in my whole life. I was also able to shake Justin’s hand and thank him sincerely for the care and professionalism in dealing with what must have been one of the most difficult phone calls he’ll ever have to make. I’d like to again thank him, and publically this time, for the care and attention he gave my whole family at a harrowing and difficult time. Andrew was in good hands on board. Justin made sure we were in good hands too and we will all be forever grateful for that. All in all, a quite unexpected series of events, initiated with absolutely the worst phone call of my life. But like all good fairy stories, a happy ending and as with all situations of this nature, some huge lessons to be learnt and developed further for the future safety of all Clipper race crews. I would like to say how proud I am personally of all the people involved in this entire situation. They acted with total professionalism and ultimate commitment to the cause and those are exactly the values that we promote at Clipper Ventures and the Clipper Round the World Race. Nobody wants to hear a Mayday call, however this call was made all the more pertinent as it came from some of our best friends. I certainly will remember that radio call for the rest of my life. 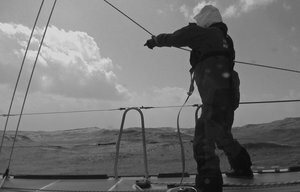 I am exceedingly proud of how the crew of OneDLL handled themselves, performing complex evolutions in cold and extremely challenging conditions to get the yacht stopped, turned around and heading back towards Andrew’s position. They achieved this with an efficiency that would be the envy of many professional crews. Progress back upwind towards Derry’s last position was slow due to the large seas, strong wind and powerful squalls but the OneDLL crew did a great job as on scene support and communications, thus enabling Derry to concentrate on their search pattern. It can't be understated just how challenging the conditions were. All credit must be given to Sean McCarter and his entire crew for their successful recovery of Andrew. It was a source of massive relief and joy when we heard that he had been recovered successfully and was alive". One of the bleakest experiences of my life to date, hearing the shout “Man overboard” when you are in the middle of one of the world’s harshest oceans is something no crew should have to hear. That said, no-one panicked, the team had just one focus, to recover Andrew. What so many of us forget, is that the crew are just ordinary people, and although timely, the recovery was flawless. For this we must remember, we as a whole crew achieved something truly extraordinary that day. A message came through from our race director Justin Taylor. ‘MOB recovered. Initial reports of shock and hypothermia. More detail to come as I receive it’. I remember responding with just, ‘THANK GOD’. The feeling of relief was immense. It felt like a miracle, and I breathed a sense of relief for Andrew and his family, and that Jonathan and I would no longer be faced with writing the first death statement in the Clipper Race’s nineteen year history. I reached the office and Jonathan was already at his desk. He didn’t say anything. He just got up and gave me the hardest, longest hug. It said everything. For some crazy reason when Sean shouted out ‘man overboard’ I honestly thought how strange it was to have a MOB drill in the middle of the North Pacific, but how very thorough of Clipper race to ask the Skippers to run a drill! For the next hour and a half on deck searching the huge waves for an orange speck I thought about all the reasons why Andrew couldn’t have turned on his AIS beacon. Once the beacon came on I only had one thought, that Andrew was well enough to turn it on and that we were going to find our friend alive. The events of the night of 30th March 2013 were relayed to us at home in Derry through the then Mayor Martin Reilly we were shocked but elated in equal measures. To have someone go overboard our own Derry Londonderry Doire Clipper race yacht wasn't what we envisaged at any stage throughout the race. We were just glad that the outcome was positive and that Andrew would make a full recovery. 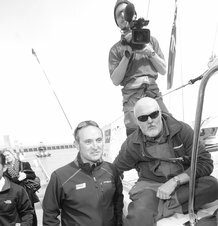 The whole crew made the City of Derry Londonderry so proud and I was especially pleased to meet Andrew in New York and hear first-hand of his experience of MOB and that of his skipper Sean McCarter who successfully led the team to saving Andrews’ life. It is only upon reflection that the magnitude of the event truly hits home. At the time there was no pause for thought, everybody just assumed their respective roles as trained. For the very longest hours we collectively focused on one thing only, locating and getting Andrew back! My prayers were answered! 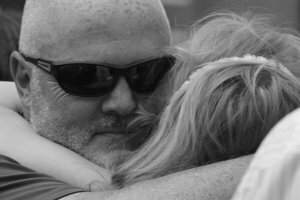 Such relief for everyone involved.The next few days and weeks I regularly thought about what Andrew had gone through and the very strange night I’d had, perched entirely on the edge of my bed while all the other events took place. We got an unusual signal from the skipper that he wanted to talk to everyone, kind of out of the blue at an odd time for chit chat. We get the message that a crew member on another boat has been lost over board, total silence! “who”? someone asks, “we don’t know at this point”. Other boats are helping to look. I get a heavy sinking feeling knowing this is very bad. We numbly return to our tasks someone shouts Clip on. We all think ‘yes I will clip on this time’ for sure, and we all do. Watch ends and off to bed with nothing said. Sometime later we learn that the man over board has been recovered. It was not till we got to port that I learned that it was Andrew who went over board and that if it had not been for his dry suit and AIS he would never have made it back alive. We met on shore, shake hands, embrace & talk. I can see he is a changed man, little wonder! I knew Andrew was a strong chap, but this was a quite amazing survival in some of the most extreme conditions on the planet. I was amazed at the calm and composed manner in which Andrew recounted his experience whilst wrapped in a cocoon of sleeping bags and hot water bottles to regain his body temperature. I was mindful of the impact of the search to find Andrew had upon the crew as a whole. As part of our race training we undertook sea survival training. But suddenly the reality of what we had been trained to contend with was grounded with the images of Andrews rescue that now seemed ever present in the worlds media. Shock evolves into action in a split second. I raise my arm to point to our crewmate floating far too quickly towards a choppy horizon. For me, the noise all around us has become merely a background murmur. I have one job to do. Don’t lose sight of Andrew. Three massive rolling waves later, I did! Later I am told over 90 minutes has passed. They were very long minutes. Ones I am in no hurry ever to repeat. And the lesson? Don’t ever give up. No matter what.